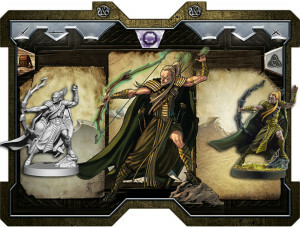 Home » Articles » Previews » Sword & Sorcery Preview – Part 1: The legend begins! Sword & Sorcery Preview – Part 1: The legend begins! Evil is on the move again. After centuries of bloodshed and war, the last heroes fell to the growing tide of monstrosities, their memory fading away like sand in a gale. 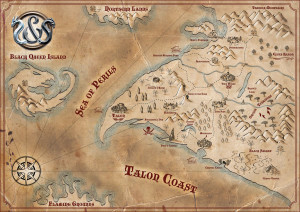 The land of Talon Coast is helpless, as the armies of darkness surge forward, threatening to extinguish the very light of the sun. But there is one last bastion of hope, one final attempt at abating the flood of corruption: Claudius, High Priest of the Temple of Heavenshine, sacrifices the holiest relic of the land to summon the fallen heroes back to life! Weakened by their own resurrection, yet determined to return hope and justice to the land of Talon, the reborn heroes will wage war against this scheming evil in its many hideous forms. 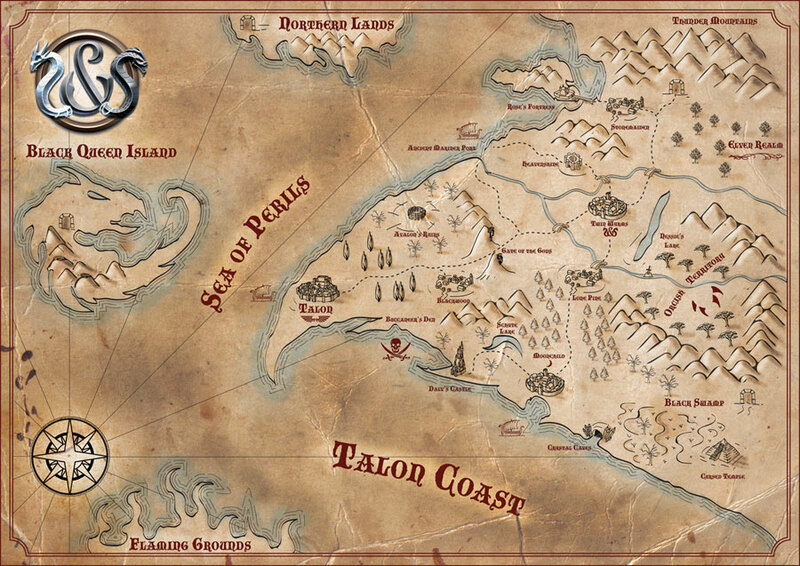 Land of Talon, the Sword and Sorcery setting. Sword and Sorcery is a fully cooperative fantasy board game in which the players become heroes who must explore dangerous ruins, ominous forests, and besieged cities to not only save their country, but to gain back their very soul, shattered by the resurrection spell. Their skills and abilities are the last, best hope of Talon’s Coast, but also their own only chance to become whole again. Created by Gremlin Project studio, the same crew that conceived Galaxy Defenders, Sword and Sorcery brings countless hours of high adventures and quests, as the heroes battle their way against evil hordes, shaping both the future of Talon and their own destiny. In Sword and Sorcery the heroes fight through quests, linked in a campaign. Each quest pits the heroes against traps, monsters and mysterious powers. Not only will the characters have to make their way with steel and magic, but they must also face moral dilemmas and choose between Chaos and Order, or the dangerous path of Neutrality. Heroes’ alignment influences the adventure path and the powers the heroes themselves wield. As the heroes grow in power, their souls return to them, bringing forgotten memories and new abilities, and enabling them to stand against the most powerful foes Evil wields against them. Elf hero figure shown in three different versions: the mold in resine, the drawing and a hand-made painted miniature. Sword and Sorcery: Immortal Souls, the first set using the new game system, contains everything you need to face daunting tasks and fight back the evil surge. The game includes 26 finely sculpted plastic miniatures (5 heroes, 20 monsters, and a master enemy); eight custom 10-sided combat dice (4 red and 4 blue); 20 double-sided map tiles to create buildings, dungeons, and outdoor areas in which the heroes battle their foes. Additional contents may be added along the crowdfunding campaign on Kickstarter, from October 15th to November 12th. The game mechanics control monsters and traps through several decks of cards: 20 Enemy cards detailing the enemy; 13 Enemy Power cards defining special powers the enemy may possess; 12 Enemy Scroll cards describing the A.I. for each enemy (including movement, combat behaviour, and favoured enemies); and 15 Encounter cards dictating which enemies act in the upcoming turn. An event system, controlled by 20 Event cards, tracks the passage of time and activates special events and encounters. Monsters are not the only danger: traps (controlled by a 13-cards Trap deck) may spring from doors or chests. The heroes, of course, are not alone in their quest. They will find allies and will be able to empower themselves by destroying enemies and solving puzzles. As their soul shards return to them, the heroes will acquire new powers and abilities, detailed in special decks of cards, one per hero. Some powers; however, may only be chosen if the hero has the proper alignment. Heroes can also loot monsters and chests for treasure (42 Treasure cards), equip themselves with new weapons and armours (which can be upgraded at the Forge), buy or sell items at the city Emporium (40 Emporium cards), or keep items in their secret stash. Face the challenge of Sword and Sorcery: grab your weapons, prepare your spells, and seek your lost soul while saving the lands of Talon’s Coast from a gruesome and terrible fate! In the next preview article, learn more about the heroes. Stay tuned!